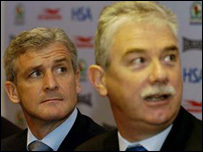 Blackburn Rovers chairman John Williams has told fans it may take time to unveil a successor to Mark Hughes. Former Bolton boss Sam Allardyce is a leading contender but Williams told BBC Radio Lancashire that Rovers would not be rushed into making an appointment. "I can't set a timescale - there's no point in setting false hurdles that you don't need to jump over," he said. "We can't be too hasty. It's a crucial, important decision but it's obvious I'd like to do it as quickly as possible." He added: "My thoughts are to look forward and make sure we replace him [Hughes] with a candidate who can build on the stability and success of the last half-a-dozen years or so. "We've been very lucky with Mark. He's been terrific for us - he wanted a fresh challenge and the challenge for my colleagues and myself is to make sure we find the right man." Williams said he felt Hughes' profile had risen over the past year: "We got an indication round about the New Year when the Newcastle job became available. "There was a lot of media speculation that promoted Mark to one of the favourites for that. "I'd have to say that at that point in the back of your mind you are thinking about what would happen if Mark was to decide he wanted to move on. "Whilst these things are never welcome, you can never say it's a total shock - you can't actually prepare until it becomes a fact, which it now has." Williams confirmed Hughes is set take some of his coaching staff with him to Eastlands. Anyone thought of Kenny Dalglish coming back to Ewood? "He will be taking some of the back-room team with him, but I think in fairness to Manchester City that's their prerogative to announce that to the world," he added. Hughes led Blackburn into the Uefa Cup twice during his reign and also presided over three cup semi-final appearances. Williams said: "It's been genuinely mutually beneficial. We've been good for each other. "We've helped propel Mark's career and he's helped us to one of the better periods in our recent history."